Yay! It's blog hop time again! Welcome all hoppers, especially those who are visiting my blog for the first time! This post is doing double duty as today is my day for two different blog hops. 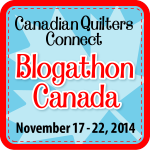 Blogathon Canada is a fun hop organized by Sew Sisters Quilt Shop as a way for Canadian quilting bloggers to get to know each other a little better and introduce ourselves to new friends. There are giveaways on the Sew Sisters blog every day this week, so be sure to pop over, check it out and find the list of all the participating blogs. And I'm so excited to finally get to share my projects for the 'Twas the Night hop hosted by Mme. Samm of Sew We Quilt, with Marlene of Stitchin By the Lake as our cheerleader/head elf. Mme. Samm's blog hops are always fun and inspiring, but this one has an extra special element. Since the theme of the hop is last minute gifts, we were all asked to make a little something for the person after us in the schedule. It was a lot of fun to plan out what I would send (mine went to Bente, of I Like to QuiltBlog in Germany), and then I couldn't wait for my package from Carolyn, of Sew. Darn. Quilt, to arrive. What wonderful goodies she sent me! 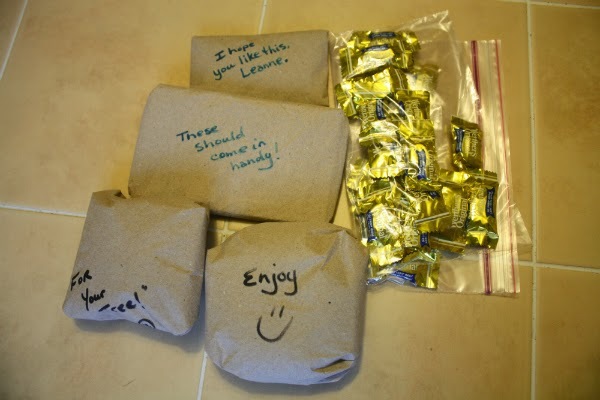 Even the packaging was fun since she had little notes written on each of the parcels. And mmmmmm, Werther's! 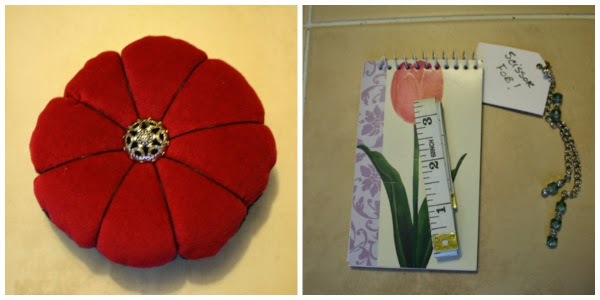 The pincushion is fantastic, and has been getting a lot of use already. I'm using the notebook to keep track of my daily to-do list and you can never have too many measuring tapes, right? I've never had a scissors fob before, but it sure is pretty. As for this cross-stitched Christmas tree ornament...wow! Absolutely beautiful, and personalized too! Thank you so much, Carolyn! I love it all! As soon as I signed up for this hop, I knew I wanted to make ornaments. I love to give ornaments to lots of the people on my list, so it was fun trying to come up with something I could sew quickly. Except the process was anything but quick! My first attempt didn't work out at all. I used batting, but I found that made it too stiff. I had an opening left from turning the ornament right side out and I stitched it closed by machine, but I didn't like that the red thread showed on the white fabric. I also found the stitching made the whole ornament look really messy. The fact that I caught the ribbon in the stitching only made it worse. So, on to attempts number two and three. I was pleased with both of those, so I sent them to Bente. She is sharing them on her blog today. After that I kept playing around with different ornament ideas, since I knew I wouldn't be sharing the ones I sent to Bente. That's when I found these fantastic free-motion Christmas trees. After a little more trial and error, these are my ornaments. There's no batting, and because the front is all one colour, the thread I used for the topstitching doesn't stand out and take attention away from the trees. I turned the ornaments and stitched the opening closed by machine, then quilted the trees. The one on the far right distorted a little because of all the stitching, so when I make more I'll try adding a thin stabilizer of some sort. My favourite design is the pebble tree. My next idea came to me when I was trying to think of what to make for the kids I babysit this year. Eventually, I settled on a bean bag toss game. 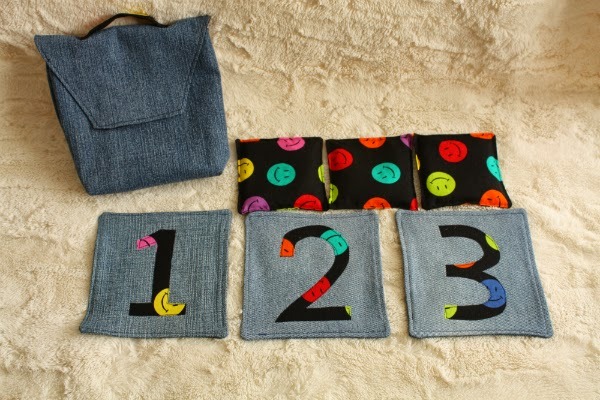 The bean bags are made of scrap fabric, while the targets and the pouch are made of recycled denim. I have a couple of shelves stuffed full of old jeans that I've been keeping for 'someday' and this seemed like a good project to actually use some of it. I made four sets of the game, including one for a family with three kids. Rather than make three sets of everything, I made each of them their own bean bags and then one set of targets and one pouch to hold it all. If you have kids who would enjoy the game, my Bean Bag Toss tutorial will show you how to make your own. I'm working on a separate tutorial for the Denim Pouch because one tutorial for all of it would have been too long, but I ran out of time to get it finished before today. I'll get it finished up and posted in the next couple of days, then I'll add the link here and to the Bean Bag Toss tutorial. If you're finding yourself really short on time this year, I will be making some ornaments and some bean bag toss games available in my Etsy shop. Love your tree ornaments...the bean bag toss is so perfect! You got some lovely gifts, and I like the ornaments and the bean bag toss game! Thanks for sharing. The bean bag toss is a perfect gift! Your little trees are sew sweet. Thank you for sharing and Happy Holidays!!! Your tree ornaments are lovely and what a great idea to send a gift to the next blogger! Love your tree ornaments. The bean bags are great. I did those a couple of years ago for the grandkids and they still play with them. You received some great gifts and I really like your bean bag game. Great gifts received...love your ornaments...no fmq here yet so I will just admire lol. Oh and that bean bag game idea is great. BTW I'm also apparently passing by for the Canadian Blogathon....two hops, one visit LOVE IT! You received a lovely collection of gifts, and those these free-motion Christmas tree ornaments are really wonderful! what a great collection of gifts, how nice. Love your bean bag toss game, thanks for the tute and other great ideas! Great gifts from Carolyn.... 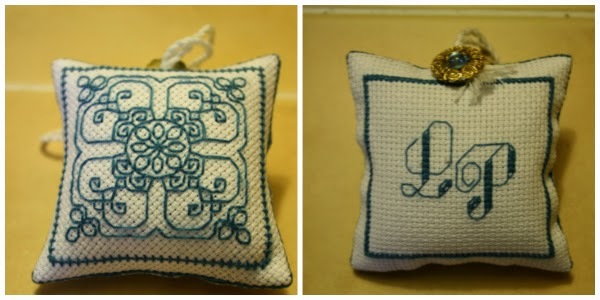 I especially love the cross stitched ornament! Also loved you gift ideas, especially the FMQ trees. Thanks for sharing today! Lovely gifts. That button really sets off that pincushion doesn't it? Your ornaments are really cute. And I so love that you thought of the kiddoes. What a great game. Thank you so much for sharing. Hope you enjoy your holidays. Those bean bag games are a wonderful gift! Love that they come with a pouch for storing and transporting the game. And those Christmas tree ornaments are super cute, too! Lovely work, Leanne! hi Leanne ,..Marjorie here from marjoriesbusycorner. Nice blog you have!! we have 3 grown boys!!!! Your trees are lovely, great idea. Speaking of great ideas, the bean toss games are right up there. the gifts you received are terrific, love the personalized ornament. I love the Christmas Tree Ornaments, your FMQ is great!!! Oh and the gift you recived are wonderful too, lucky you! Your bean bag toss games are wonderful. My kids really enjoyed playing with them back when they were little. I like your ornaments. I'm so happy you like your gifts, Leanne. I'm going to give the FMQ ornament idea a try for another swap I'm involved with, Thank you for this! The bean bag toss is a great kiddie gift. Your gifts are really sweet... Love those pincushions! I might just have to try your bean bag toss game. My grandkids would love that! Your ornaments are so cool! Love the idea!! And your bean bag toss...great also! Thank you for sharing!! Can never have to many pincushions, great gift!! What a great idea for the kids on our list! The little tree ornaments are also really cute! Such beautiful gifts you received and sent! I love the bean bag gift idea for children...my grandsons would love them! The FMQ for the tree ornaments is a great idea and I LOVE the idea of the bean bag games for the little ones. Absolutely Lovely, I Love your Ornaments! Thanks so much for the Bean Bag Toss Tute!! My Granddaughters are going to Love this!! I love that bean bag toss game! This is so sweet for you to make the kiddos you babysit. Very nice work! Love the trees - I'm doing the same thing will little red stockings. Great to practice little quilting motfs! Those trees turned out great!! And I love those bean bag games for the kids, great idea!! Love the fmq trees. What a fun way to practice! 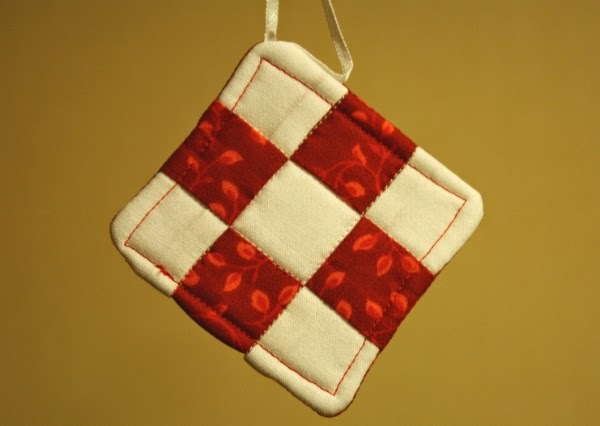 Oh, love those FMQ ornaments, they are so charming (and look fun to make... must add them to my sewing list, thanks!). Great idea for a gift for kids (young and old alike, I'm thinking... we're never too old to play games ;o). Thanks so much for sharing your ideas, Leanne and enjoy those lovely gifts from Carolyn! I love the ornaments. Very pretty.I love a tree with all hand made stuff on it. I made a bean bag game for my grandsons when they were little and they had so much fun with it. I loved it because it kept them busy and they didn't break anything with it. LOL Very pretty gifts you received also. Those bean bags are a wonderful idea! I have that stack (or really, basket) of jeans too. This would be good to use them up with. :) Merry Christmas, Leanne! I love how your Christmas trees turned out! Isn't Lori's site great, I get a lot of inspiration from her. Thank you for sharing your ideas, the bean bag game is sure to be a hit! Great Minds think alike. I've made a bunch of Benabags for my grandchildren this year. The targets are a cute idea. Thanks for sharing the tutorial. I used my Serger. The Tree ornaments turned out just right. Have fun decorating the tree very soon. 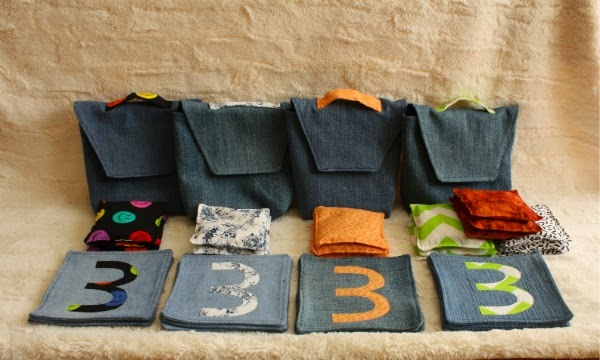 What a great quick gift idea for the kids,love that you up-cycled the jeans for these! The tree ornaments are super cute! Popping by via the Blogathon :) I love the tree ornaments you made, they are adorable! How cute! The beanbag pouches are great. And your trees are so darling, what a good idea. The ornament you received is just lovely. Your ornaments are sweet - I like the one on the left the best. What a creative idea to make for the kids - I'll bet it's fun to play, too. You are getting lots of visitors today! Really like your bean bag toss game, will keep that in mind when I need a "kid" gift! Opening all those sweet packages had to be such a delight and the presents are wonderful. You sent some very sweet things, also. This is such fun to see the swaps. You tree ornaments are so unique and pretty. Great picture of them, by the way. Love the bean bag idea. Great post! Lovely gifts from Carolyn. I love Werthers too. Your tree ornaments are lovely. What kid wouldn't love those neat bean bag games. Merry Christmas. Love your Christmas ornaments. Looks like the kids will have fun with their new game. Happy Holidays. What a cute bean bag game. Thnx for sharing your projects today! Love our ornaments! and the bean bag toss is a wonderful idea for little ones! I am going to check out that tutorial! Hi Leanne! I am so psyched about your bean bag game!! I have three little grand niece and nephews. I have been searching for something to make for them and it is PERFECT!!!! Thanks a million! That bean bag game is a great idea! Thanks for sharing! Your ornaments are very cute and what a great idea to make Bean Bag games. Love the bean toss game! Super! You received great gifts - lovely personalised Christmas ornament. All the gifts you received were very lovely , and so were the ones you gave especially the Bean Bag Game. Great projects! Love the personalized Christmas ornament you received. Thanks for sharing. Your gifts you received are lovely. The ornaments are great too. I make my kids and grands an ornament of some sort every year for Christmas. The kids will love the bean bag toss. Lovely gifts received and wonderful gifts made! Love your little tree ornaments. You made some great gifts. Carolyn made you some gorgeous gifts. Have a very joyous holiday! 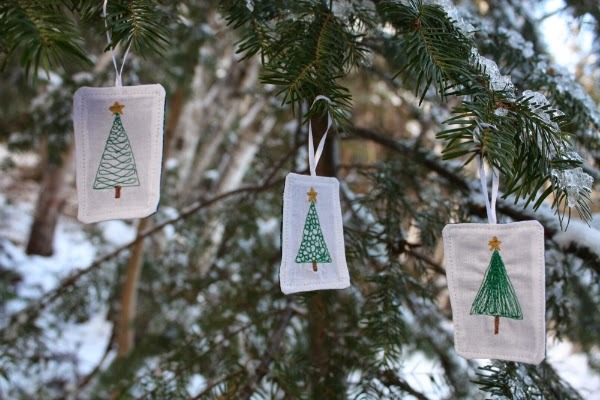 Cute tree ornaments and what a cool idea for a bean bag toss game. You are most clever!! Love your ornaments, but find your bean bag toss games to be most delightful! Love that you were able to use up some of your recycled denim. I have a pile of old jeans stashed on a shelf, too!! I fully intend to check out your tutorial!! You really received wonderful gift, I always admire people who can stitch so regularly! And I like your ornaments, simple but still having the little "extra", lovely! Love the ornaments you received....and, your own tree ornaments are simply great. Good job. Ornaments are a forever gift!! Each year when you take them out you are reminded of friends, family, and activities that brought you joy! Nice to meet you, Leanne. Nice tree ornaments. Thanks for sharing. bean bag toss game is a fantastic idea! Leanne, such sweet gifts from Carolyn...and your ornaments are sweet too!! Love the bean bag toss game...great idea!! Happy Holidays! !